Sometimes the most welcome sights are the most unexpected. "Every action we take is a choice. Some are deliberate, some are automatic, but each represents a decision between paths. Viewed this way, even inaction is a choice, albeit a weak one." "Wanting to believe something doesn't make it true, the same way wanting someone doesn't make them yours." "The most powerful choices are the ones that disrupt the status quo - that break free of momentum and push into the unknown. They're also the most terrifying ones." "Time is not static. You can never get a choice - or a moment - back. The best you can do is witness the effects." "Around us, I could hear the fissures forming, hundred pivot points created by a single kiss, the universe cracking wide because of this one instant, this one boy." Not real, I tried to tell myself, but he felt real - entirely solid and strong and alive as his arms wrapped around me, anchoring me against him as the world started to spin. He tasted like mint and secrets, and I opened my mouth to his, craving more as his fingers traced languid circles down my back. Truth is as fluid as water, as faceted as diamonds, as flawed as memory. 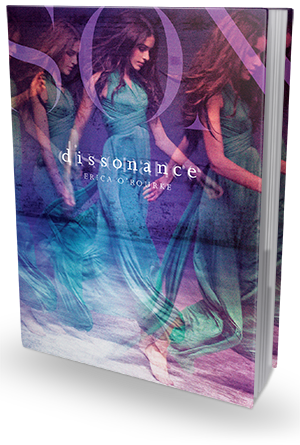 Dissonance is a top-notch YA science fiction novel - hands down, one of the best ones in the genre. Its complexity can be overwhelming, and it's a bit confusing at the beginning, but O'Rourke's accessible and captivating writing style and her unmatched plotting skills make this book a fabulously addictive page turner. I absolutely loved every second of it. Delancey Sullivan is a Walker. Not the zombie kind from The Walking Dead, though, no worries. She is genetically predisposed to travel between the many universes created by all the decisions made by people all around the world. Being a Walker is magnificent and empowering, but it's also a lot of work. Walkers are responsible for cleavings (unraveling worlds going bad), tuning (fixing worlds and/or echoes) and keeping everything in order. So that, you know, the one real world doesn't fall apart. There are tons of rules Walkers need to live by, including but not limited to, not engaging with the Echoes while Walking and absolutely no relationships with non-Walkers. Unfortunately, following rules is not Delancey's strongest point. And the fact that the Council is obviously keeping secrets only makes her dislike of the authorities stronger. O'Rourke has written a book in which there isn't a dull moment. Seriously. The beginning, as I already mentioned, might be a bit heavy on world building and, therefore, confusing, but once you get past the first 40-or-so pages, you're strapped tight on a roller-coaster ride of visually appealing, brain-tickling fun. Mystery and danger plays a big part in this story, there are some unexpected developments and heartbreaking moments woven into the plot, and if you like your books ambitious and with substance, you will definitely appreciate Dissonance. Let's talk a little bit about our MC, Delancey. Here's what Eliot says about her (and to her): "You don't listen to anyone else. You don't think about anyone else. You don't think about the consequences. You care about yourself, and that's it." And that pretty much sums up her character. Del really is reckless, self-centered and unable to think her actions through, which proves to be a dangerous combination of qualities. On top of that, she's also very cocky. She's a great Walker, a natural - very talented and capable - but she doesn't follow any rules (in fact, breaking rules seems to be her favorite daily activity). As much as I wanted to slap her straight, though, I also kind of liked that about her. If I have to choose between goody-goody, whiny and defiant, I'll take defiant any day, and Del was just that. Ridiculously defiant, but also really fun to follow as a lead character. "My family...," I began. "They're big into making choices. Big decisions, small ones... They believe life is made up of every decision you've ever made, one leading into the next, like the notes in a song." Simon nodded, his pencil flying over the page, and the misery inside me ebbed. "But that's crap. You can lead a perfectly good life. You can make great choices, and in the end, completely random events will undo everything." I pointed to the tiny headstone. "That's a baby's grave. No one chooses that. No one wants that. People die not because of they did or didn't do. It's not their choice. It just... happens. Why bother choosing if the world is going to do what it wants regardless? What's the point in trying to make a difference?" And to be perfectly honest, I grew to appreciate her inquisitive mind always questioning everything and her courage to stand up for what she believed in - even if she was the only one believing in it. Unlike her overachiever sister, she did not care about praise and recognition, and she did not follow orders blindly, she made her own decisions, even if sometimes they were based on her poor judgement. In my book, that made her a great, multi-layered character. Dissonance is a gripping, gorgeously rendered and intelligent tale that could easily be turned into an awesome blockbuster science fiction thriller. A deftly written, intellectually stimulating sci fi spectacle. O'Rourke did a very impressive job fleshing out the universe, weaving in all the complex scientific details and making it all very believable and authentic. This book has both the breathtaking, non-stop action and mind-bending science fiction concepts, but it's also pretty emotionally engaging in some aspects. It's entertaining and fun to read, but it's also very thought-provoking, inviting the reader to ponder themes of fate, duty, responsibility, love and power. And, most importantly, the choices we make. And the consequences that follow.